Beth & Cory's Mom: Does Your Cell Phone Plan Earn You Points? You'll notice I've been talking about U.S Cellular and my new cell phone quite often these past few months. In case you missed it, it's because I'm part of the U.S. Cellular Better Moments Blogger Brigade. I have been compensated for my participation in the program and received a new phone. In return, I get to tell you a bit about my experiences with U.S. Cellular and my new phone. All opinions are 100% mine. This month - well, last month actually; how did it get to be October anyway? 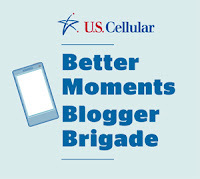 - I want to let you know a little bit about the U.S. Cellular Rewards Program. It's really easy to earn points, starting by signing up for a rewards-eligible plan. As far as I know, most of the plans are eligible, and you earn points every month just for having the plan. You can also earn points for attending a device workshop, referring a friend, paying your bill on time, and even having a birthday. Points can be redeemed for faster phone upgrades, free accessories, and more. Here's one I didn't know about - points can even be redeemed for tickets to concerts and sporting events or for signed sports memorabilia. Sounds like they have a little something for everyone. We have quite a few Rewards Points in our account, because we keep saving for that free phone. Unfortunately, we haven't had enough for the phones we've wanted when it was time to upgrade, though there are always several phones available for free. It would be nice if points could be cashed in to pay for part of a new phone, but there isn't really a cash value on the points, so it doesn't work that way. Believe me, I've asked! Next time we should have enough points for the latest, bestest phone - for free. I did look at accessories when I got my Samsung Galaxy S4, but I didn't really like any of the cases so I ended up buying one from Amazon. There are several available, though, and being able to buy them with points is very nice and convenient. I'm thinking about getting some of the little speakers to plug into my phone to play music - or maybe the Bluetooth speaker. Either one would be nice to have, and we have enough points to get them for free, while still saving for that next free phone. Did I mention how easy it is for those points to accumulate? It's kind of fun to get points toward free stuff just for having and using a cell phone plan - something we'd do anyway. I'm sure it's even more fun to actually redeem those points, now that I've started looking through the available accessories. Redeeming is easy to do, too - points can be redeemed online, in store, or by calling Customer Service, whichever works for you. Does your cell phone plan earn you points for free stuff? If not, be sure to check out the U.S. Cellular Rewards Program, and you could be on your way to earning a free phone, too.